Happy St. Patrick’s Day! 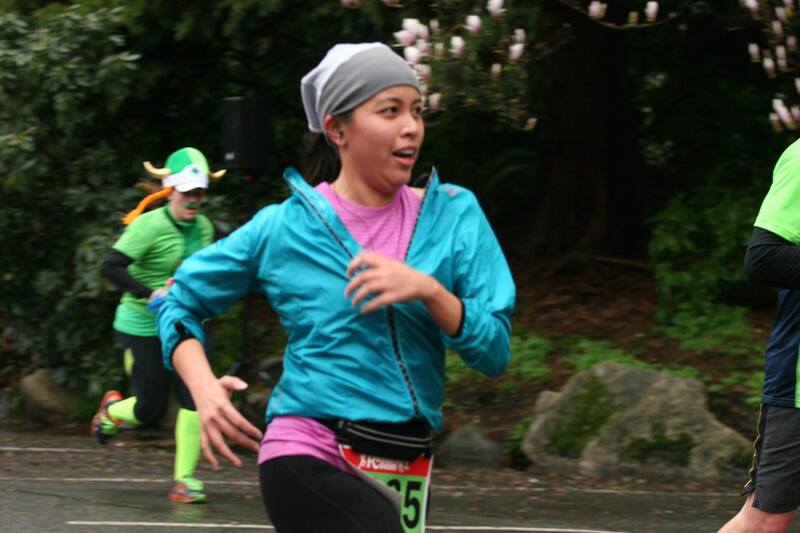 The BMO St. Patrick’s Day 5K was my second race in 2 weeks and it was a short one (thank goodness). It was my first big race, big in the sense of number of participants. Over 1,500 runners woke up bright and early to take part in a 5k fun run at Stanley Park, complete with green costumes and funky hats. Leading up to the race, I’ve been keeping a close eye on the weather forecast. Of course, as luck would have it, there was a rainfall warning on the day of the race. 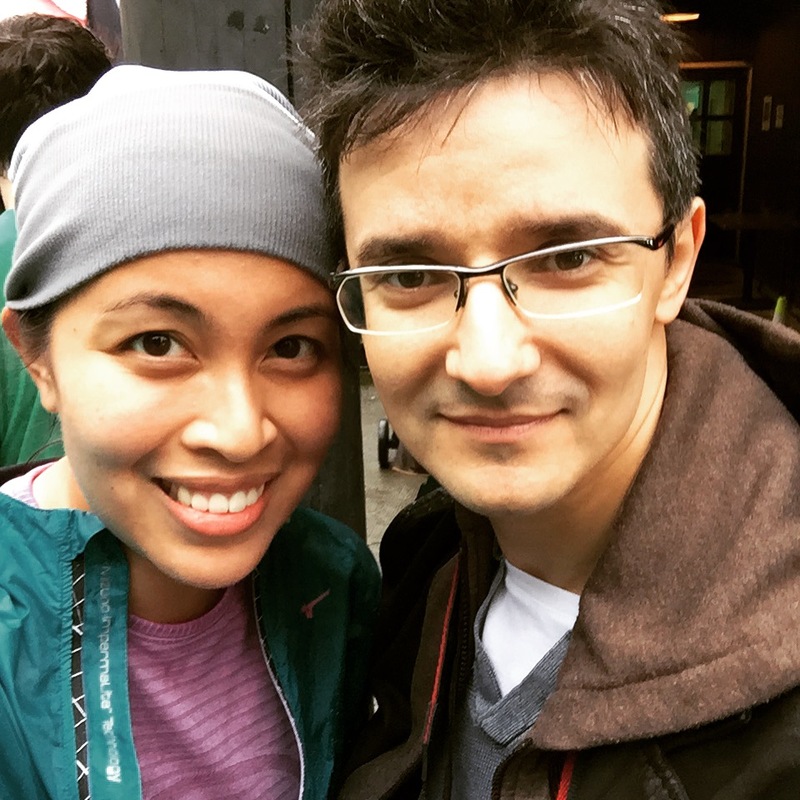 We woke up and I could see the rain pouring already and I was bracing myself to be drenched pretty much the entire duration of the race and then some. I mentally prepared as much as I could and suddenly the rain stopped. I couldn’t believe it. 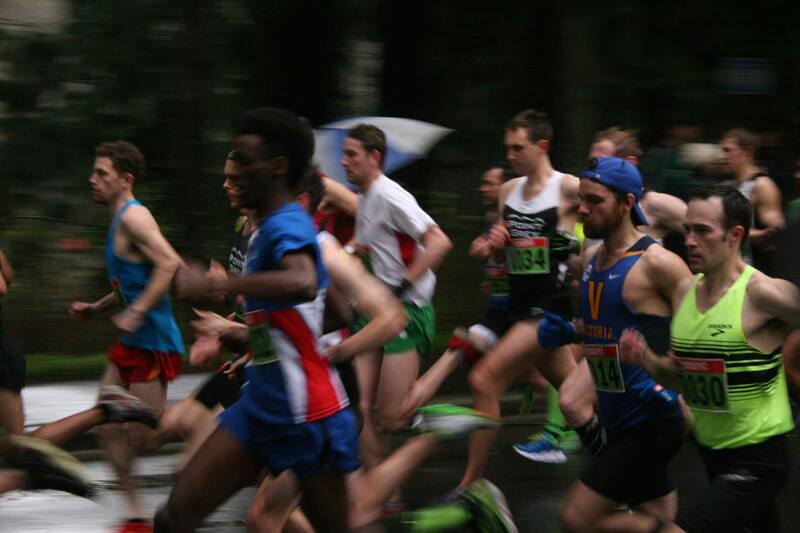 It was actually a little warm for me to be wearing a jacket by the end of the race. The course itself was quite nice. A Maserati led the runners through the course, which was pretty cool. There were so many people that I had to pretty much fight for position during the first 10-15 minutes of the race. It was understandable that not everyone was keen on running so I had to maneuver my way through as many people as I could without losing gas. I figured that this would be good practice for the Sun Run… in anticipation of the massive crowd that awaits me on Georgia Street. I finally made it to a spot where I was keeping up the pace that I wanted. The “flat and fast” course they advertised seemed hillier than I originally thought (the seawall was flatter than this). Fortunately, the hills were gradual and I think I was able to keep up my pace throughout the whole thing. The more I race, the more I realize that it’s such a huge mind game, in addition to a physical challenge. If you’re not focused, you can easily give in to fatigue and stop. I can only imagine keeping this focus up for an entire marathon… good thing I’m only training for a half. The last stretch of the run was a hill leading up to the Stanley Park Pavilion. I managed to scrounge up some of my reserves and crossed the finish line strong (leaving a few people behind). I finished the run in 30:57… Not bad for my first official 5k race. I’ll take it 🙂 Enjoy my suffer face below as captured by my #1 fan, Cuski. 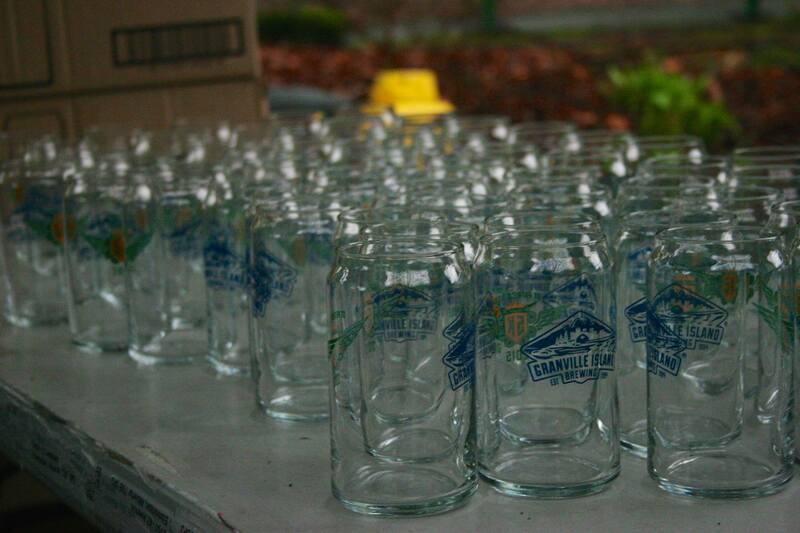 At the finish line, we were given beer glasses courtesy Granville Island Brewing. I thought they would be offering a free glass of beer to finishers as well but alas, no recovery drink for me. It was a little disappointing, especially since I’ve seen big races give away a growler with a free fill-up to participants. The food tent was great though: coffee and cookies from Starbucks, yogurt, Granola Girl granola, stew from Urban Fare, mini cupcakes from Cupcakes, and my favourite.. KIND bars. I regret not getting one of each flavour. 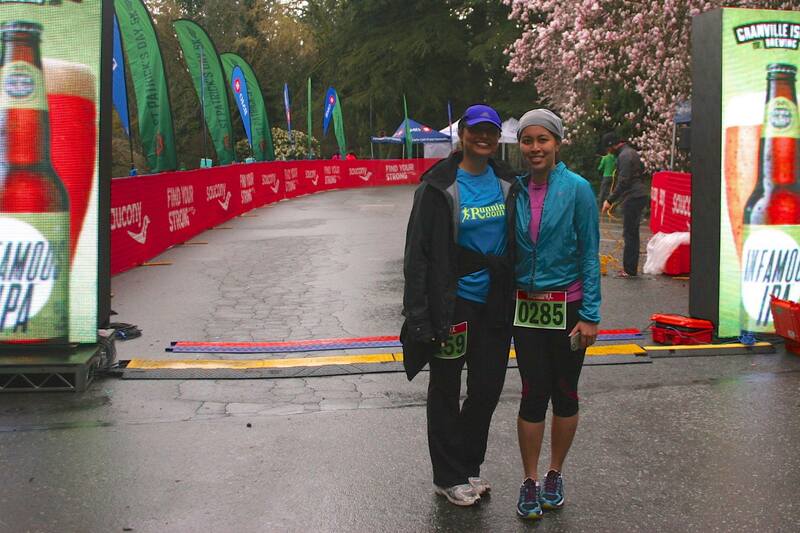 I ran the race with my colleague and friend Zahra Alani. You may recognize her as she is CTV’s weekend weather caster. It was her first race and she did very well! Awesome job, Zahra! Next up, the Modo Spring Run-Off 8k this Sunday, my last race of the month and the week after, I will attempt an 18k long run. Wish me luck and strong legs!